" Muslim minister calls on Christians to stand up for their faith"
Christianity is in grave danger of being marginalised, Britain's only Muslim cabinet minister will tell the Vatican today. Baroness Warsi will call for Europeans to take more pride in their religious roots and for Christianity to play a greater role in public life. Baroness Warsi is leading a UK delegation to be received by the Pope at the Vatican today. With seven ministers, it is the largest ever UK mission to the Holy See. The peer, who is co-chairman of the Conservative Party, said she feared that religion was being increasingly downgraded or dismissed as an eccentricity. 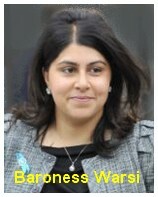 Baroness Warsi will call for faith to be given proper space in public life. If you take this thought to its conclusion then the idea you're left with is this: Europe needs to become more confident in its Christianity. Baroness Warsi will be received by Pope Benedict XVI today at the Vatican Lady Warsi will say that centuries of Christianity have shaped British culture and civilisation and will praise faith for 'inspiring, driving and motivating' good works. The Conservatives are playing to the Christian vote again. After Cameron's eulogy about the King James Bible (see below) which has probably caused more deaths and war than any other publication, we now find Tories employing the nominally Muslim Warsi to insist that the Vatican increase its religious hegemony in Europe. Is that the same Vatican which hid an estimated 40,000 child abusers in its ranks over the past thirty years on Ratzinger's watch? See here I wonder what that did for 'social cohesion'? Is Warsi ignorant of the fact that exceptions to advantage Christian churches are already found everywhere within our society. They don't pay tax, they don't pay rates, their religious schools are subsidised by the rest of us and despite their hypocritical stance over gambling they are the greatest recipients of Lottery funding to repair and maintain their churches and palaces. To cap it all their Bishops have the unmandated swing-vote in the Lords to interfere with democracy! How much more do these greedy people want considering that only 7% of the population actually go to church? ... what I am saying is that the Bible has helped to give Britain a set of values and morals which make Britain what it is today. Are we to assume that Cameron actually believes this drivel? Even C stream sixth formers know these things are lies so why did Cameron think he could get away with saying it and give the nod to Warsi to underline it? The Christian vote perhaps? Historians cannot and do not deny that Britain was run successfully by people of the Celtic pagan religion for thousands of years before Christian Missionaries came to our shores and usurped the old religion with their own. This is a matter of historical fact. Celtic civilisations gave Britain (and the known world) a fabulous and valuable heritage which underpins almost everything we do today. Our major festivals now considered Christian were all originally pagan, our laws, our manufacturies, boatbuilding, crafts, jewellery and art, our language, why even the names of the days of the week are remnants from our vivid and beautiful pagan ancestry. To infer, as the ignoramus Cameron and Warsi have, that the people of the British Isles were uncivilised and immoral before Christianity educated us in their ways and gave us the Ten Commandments, is PRECISELY the same colonial imperialist arrogance which hallmarks the missionising of Africa and the attack on traditional beliefs there. That may be the lacklustre standard of scholarship at Eton but elsewhere we can think for ourselves. We remind Cameron that Christianity was also responsible for the Dark Ages where life stagnated for hundreds of years and it was only when someone bothered to learn Arabic that the good Christians realised that the knowledge and combined wisdom of the classical pagan civilisations, which were previously believed to have been totally lost because early illiterate Christian fanatics had destroyed their writings through sectarian jealousy, were rediscovered gathering dust in Islamic libraries throughout the middle-east. 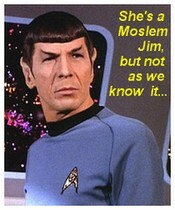 All that we know of the golden eras of Greece and Rome came to us not through Christianity but through Islam. It was Islamic students and philosophers who had for thousands of years previously seen the value of those early pagan civilisations and copied their treatises into Arabic for posterity. It was the monopolisation of pagan discoveries in geography, mathematics, astronomy, navigation, cartography, philosophy and more which eventually drew Europe out of the Dark Ages, created the age of exploration and eventually the Enlightenment. Why it was Plato, a pagan, who 'invented' Democracy for goodness sake. Does Cameron not know about the origins of Democracy? Christianity had as much to do with all this as a flea has to do with its host. The majority of people in the U.K. may consider themselves nominally Christian but only 7% of the population actually go to church regularly. More people go to football matches than go to church! Yet Cameron and Warsi have the gall to call Britain a 'Christian country'. I make much of this because the reason why Cameron was playing to the Christian Vote was the celebration by the Church of England of the 400th anniversary of the King James Bible which contains the vicious justifications to beat children. The psychopathic text of the KJB was so blatently discriminatory and morally repugnant that the churches got together internationally in 1973 to rewrite the bible from scratch using modern idiom. This enabled them to present their beliefs in the New International Version (NIV) in a much less radical light which was acceptable to modern liberal Christians. Fundamentalists absolutely HATE the NIV because of its compromises and they ALWAYS work from the King James Bible. We remind readers that James VI ordered the publication of a new bible after an illogical sequence of events. During a storm a suitor of the King was drowned off Berwick, following witch-hunt mania the hue and cry produced the Berwick Witches, innocent women who were tortured into confessing that they were attempting to kill the king using witch-curses. The King became obsessed with devils and demons and set up witchfinder generals to tour Britain to discover them as well as having his scholars produce the King James Bible which was 'flavoured' by the same psychoses. The Bible was first published in 1611 and it's teachings have probably caused millions of deaths in witch-hunts since. Proverbs 23:13 "Do not withhold correction from a child, For if you beat him with a rod, he will not die." Proverbs 23:14 "You shall beat him with a rod, And deliver his soul from hell." There are some more biblical instructions to ponder here. "First, the King James Bible has bequeathed a body of language that permeates every aspect of our culture and heritage. Second, just as our language and culture is steeped in the Bible, so too is our politics. The point we are making is that despite the fact that biblical teaching on this subject is morally wrong and despite the fact that it is causing children to be tortured and killed the Good and The Great in Britain will not condemn those teachings and instead, like Cameron and Warsi, act as though the Bible is an exclusive vehicle for good. "We look forward to a world founded upon four essential human freedoms. The fourth is freedom from fear. If you could choose what freedom means to you, would you take action to make sure you get it? Well, as you know, the SAFF has been fighting for decades to ensure that people holding minority religious views get the same sort of protection and rights as everyone else. Now the Government is consulting publicly, through the internet, to find out what sort of freedoms the population wants. You can be sure that all sorts of religious organisations will be taking part, especially the monotheistic faiths which want everyone else to join them. Will they be protecting your rights or theirs? The thing is, unless we get the views of Pagans, Occultists, and free thinkers taken into consideration, can you imagine that the next raft of legislation affecting YOUR rights will look like? And what may happen as a result? So, go to http://yourfreedom.hmg.gov.uk/ and have your say. For all the positive platitudes about Democracy in the media the system tends towards being intrinsically unfair to all minorities by its very structure (because it reflects the will of the majority) so simply voting for or against is not enough - we need to use our empowered minds and esoteric perspectives to think up more appropriate solutions and ideas for government which they might adopt or which might set them on new lateral thought processes and break the old political thinking. In short, propose in order to oppose. If we take this initiative at face value and it is not simply a trawling operation by the coalition government to drum up justification for already decided action then it us up to us and people like us to make it work; because it can be seen as a quite revolutionary attempt at microproportional representation and the first-step towards an Internet Parliament of the People. It sidesteps the biased political lobbyists, charity scaremongers and unrepresentative focus groups which have set the political agenda for the past two decades, often against the best interests of us all. Alert your friends and contacts urging them to participate. Nick Clegg (who is fronting this initiative) must be aware that it might be hi-jacked by political and fundamentalist agitators. The fundies already have letter-writing, email-writing and telephone 'chains' set up so that they can call upon hundreds of thousands of supporters to distort voting to suit their own purposes. They can do this virtually overnight. To counter this you could help by posting this article on all esoterically related forums and request support from forum readers. If everyone of you posted this article to just one forum on the net it would bring back the level playing field necessary for this initiative to really work. Post this article (or a link to it) on at least one forum. Some of the existing freedoms that could be strengthened, or lost, depending on how the consultation goes, are detailed elsewhere on our site (see links below for more information on these). What rights do you currently have? See http://www.saff.ukhq.co.uk/youright.htm along with our comments on where they could be improved, and the pitfalls within the existing law. And some general background on the evolution of Human Rights, where and why discrimination happens, to help back up any comments you have. The most important thing is for everyone to participate so please do add your comments and ideas to this government initiative. The so-called 'Freedom' Initiative began in April 2011. Nine months later and the Christian Far Right have made their power-play to turn back the clock on our multi-cultural society (see leftmost column).